At last, one resource that helps you do everything better. The biggest challenge for managers? Managing your own workload. From finding good hires to putting out fires, there's a lot on your plate. 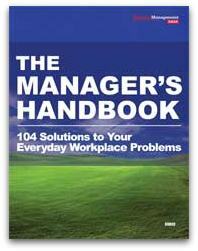 Now help is here with The Manager's Handbook: 104 Solutions to Your Everyday Workplace Problems. This comprehensive handbook will help you manage better from day one. Your satisfaction is guaranteed. Yes, help me be a better manager in every way. Send me The Manager's Handbook: 104 Solutions to Your Everyday Workplace Problems. I'll examine the handbook risk-free and discover how it helps me manage my workload and improve my performance. If I'm dissatisfied in any way, I'll return it for a full refund. No one said it would be easy, but does managing have to be so darned hard? Employee performance issues, discipline problems, workplace conflicts, time management challenges—you have to cope with them all. Not to mention finding and keeping good people, which could be a full-time job in itself. And on those rare, wonderful days when you have everything under control, a crisis flares up. Suddenly you’re holding a fire extinguisher instead of doing what you planned. Which means falling behind yet again. If only there were one resource for help with your everyday management issues. A resource with no lofty theories ... no buzzwords ... just practical advice that helps you get the job done while staying out of legal trouble. Now that resource is here: The Manager’s Handbook: 104 Solutions to Your Everyday Workplace Problems. You’ll consult this handbook weekly, perhaps even daily. Whenever a problem crops up, your handbook will be at your fingertips. And as you become a better problem-solver—and a better manager overall—the higher-ups in your organization won’t help but notice. Yes, I want to manage employees better and become an even more valuable member of our management team. Send me The Manager's Handbook: 104 Solutions to Your Everyday Workplace Problems. If I'm anything less than delighted, you'll refund my money, no questions asked. Solve my problems. Send your handbook. Solving problems may be the very definition of managing. Why not give yourself every advantage? Or better yet, 104 of them. Because the stakes couldn’t be higher. If you need to replace an employee or increase your staff, what’s it worth to make a good hire instead of a bad hire? If you have a star performer, what’s it worth to keep him or her happy and on board, instead of jumping ship? If you have average performers, what’s it worth to make them better? Or simply keep them doing what they’re doing, so the whole enterprise hums smoothly? When it’s time to get rid of a bad apple, what’s it worth to have the termination go as smoothly as possible without provoking a lawsuit that blows up the barrel? If you apply any one of the 104 helpful suggestions in The Manager’s Handbook, you’ll get your money’s worth and much more. That’s how important management is—how important you are, whether you’re a front-line supervisor, middle manager, or senior executive. We’re not flattering you, just stating the facts. How you handle problems has an enormous impact on employee performance, which in turn affects the performance of your company. The stakes for your firm couldn’t be higher. Taming the meeting monsters. The preacher. The socializer. The “no” guy. The arguers. The snipers. Make ’em do your bidding instead of the other way around. Getting slammed by your open-door policy. How to remain accessible without getting swamped by visitors. How to prevent praise for employees from backfiring. Do you sound sincere? Are you being specific? Is your team hooked on praise? Avoid these pitfalls and more. How to have “the talk”: wise words for discipline discussions. One of the longer sections, because you must tread carefully through this lawsuit minefield. Plus: the 3 cardinal rules for documenting discipline. When you have to fire someone: a manager’s primer. More lawsuit landmines to avoid, and 4 lousy excuses for not firing a poor performer. How to confront mistake-prone employees. An approach that’s as easy as A, B, C (and D). Plus: why you ignore poor performers at your peril. 12 pitfalls to avoid when giving reviews. Here’s a free hint: Don’t rely only on recent performance. Top 7 reasons the wrong people get hired. Another free hint: Don’t mistake credentials for accomplishment. Interviewing: the 10 most common manager mistakes. Who should do the most talking? Do you know your legal limits? The 5 worst interview questions. They’re not what you’re thinking. Better get the handbook. The big “don’t” for team-building exercises. How to prevent an event from landing you in court—not only your company, but you personally. In a recent court case, two supervisors were found personally liable for $50,000 each. How to fix team dysfunction. The 5 big causes and the manager’s role in removing them. Plus: how to avoid the traps of groupthink and deadlocks. The top 10 mistakes managers make. Example: trying to be a buddy instead of a boss (like Michael on The Office). When delegating work goes wrong. From setting timeframes to refusing to retake responsibilities. The 5-step, 1-hour solution for solving employee conflicts. Yes, it really works in just an hour. Identifying disenchanted workers to reduce turnover. Because you can’t fix what you can’t see. Micromanaging: 5 signs you’re doing it, 4 ways to stop it. Find the balance between effective quality control and empowering your employees. Employee documents: what to keep, what to toss. Resist that tempting circular file! The handbook gives you required retention periods for specific documents. The 12 manager mistakes that spark lawsuits. Inflated appraisals, shrugging off complaints, changing your story, and 9 more things a vindictive employee would love to sue you for. The 5 “lightning rod” terms. Use any of them and you could be in for a legal shock. The 7 red flags to watch for before you terminate someone. Over age 40? Disabled? Injured on the job? Whistle-blower? Think twice and check with your HR department first. Obviously, that’s just a taste of the 104 solutions in store for you. Did you note how many of them include multiple tips? You’ll find literally hundreds of great suggestions. The Manager’s Handbook: 104 Solutions to Your Everyday Workplace Problems is about solving problems, just as the title says. But it’s also about making things better for you and your employees. This wisdom-packed handbook will ease your pain, no doubt about it. That’s the problem-solving part. The handbook also helps you achieve tremendous gains—in your relationships with employees ... in how you inspire them to greater creativity and productivity ... and in your own value and reputation within your organization. 10 ways to earn employees’ trust. They may trust you for the most part already. Now take it to a higher level with these simple yet powerful tips. 5 ways to energize your next staff meeting. “Quick polls,” the “hour game,” and more tips to boost enthusiasm. How to make criticism truly constructive. The emphasis here is on “truly.” You may think your criticism is constructive. Follow this advice and you’ll be sure. Customizing feedback: 9 personality types. Tailor your feedback to the person receiving it, and watch the effectiveness soar. 10 things employees are waiting to hear you say. When they feel valued, they deliver more value. 3 motivational keys to spur excellence. These have nothing to do with money. The keys are free—you just need to know them. How to keep workers productive after their two weeks’ notice. Instead of a sleepwalking employee, you’ll get a strong finisher. 5 tips for setting clear, meaningful goals. Help your employees put their hearts into their work. Using performance logs to simplify employee reviews. With 6 tips for what to include. Plus: 7 steps for effective, stress-free reviews. How to get the most out of “average” performers. Every organization depends on them. Here are 3 tips to help them shine brighter. Job descriptions that attract great hires. 5 guidelines, plus a bonus tip to find ideal candidates. 25 good interview questions that assess skills. How to dig deep, whether you’re looking for a junior team member or a manager. Plus: how to extract the truth from reluctant references. 6 ways to close the sale when you want to hire a great candidate. If it helps you hire just one superstar, this handbook pays for itself many times over. 7 strategies for building team loyalty. The rewards here are immense. Plus: 10 key steps to successful projects. 6 ways to lead your team to maximum productivity. Especially important in today’s challenging, highly competitive economy. How to lead productive team training sessions. Because teams need training, just as individuals do. 6 tips for improving time management. Instead of the clock being your biggest adversary, put time on your side. How to write effective, legal job descriptions. Make sure the law is on your side. Example: understanding which job functions are essential. Yes, this powerful handbook helps you go beyond overcoming negatives to achieving huge, positive gains for your organization, your employees, and yourself. The Manager’s Handbook includes sidebars on key issues, and quizzes to help you lock in your new knowledge. The more you use this resource, the more you’ll become an indispensable member of your organization’s management team. Order now and enjoy our money-back guarantee. Who says onboarding can’t be fun? Are you able to head off employee burnout? What are discipline do’s and don’ts? Do you get what you expect from employees? What troubles lurk in résumés and references? How well do you handle crises? If you know Business Management Daily, you know we pack maximum value into every product. Pardon me for boasting a little, but we’ve outdone ourselves with The Manager’s Handbook. ... you have my unconditional money-back guarantee. If The Manager’s Handbook doesn’t meet your highest expectations, please let me know. You’ll get every penny back with no questions asked. That’s our solution for achieving 100% customer satisfaction here at Business Management Daily. Maximum value, zero risk. See for yourself. P.S. If you become a better manager, the benefits for your employees and your company are obvious. But what about the benefits for you? Working smarter instead of working harder ... getting more done in less time ... the simple satisfaction of doing your job superbly well ... the greater likelihood of a raise or promotion. They’re all excellent reasons—in fact, each is reason enough—for you to examine The Manager’s Handbook: 104 Solutions to Your Everyday Workplace Problems. You must have this handbook in your hands to truly appreciate how much it will help you, day in and day out. Remember, our guarantee removes any risk whatsoever.